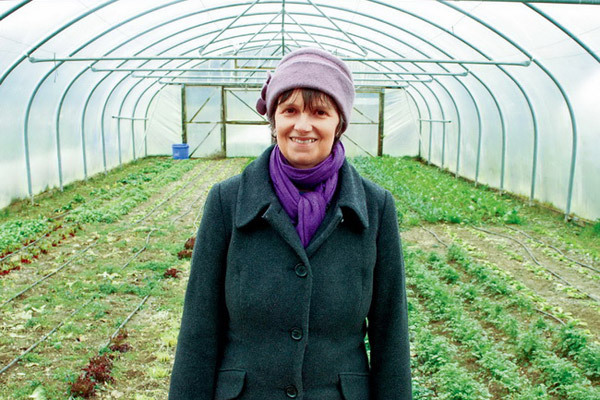 Molly Scott Cato is the Green MEP for South West England. She was very active in the early days of Transition Stroud, and one of the drivers behind the Stroud Pound. As a follow-up to our recent interview with Richard Heinberg exploring Donald Trump’s concept of ‘America First’, we wanted to speak with Molly, who for many years has been one of the most outspoken proponents of a move towards economic localisation. How does Donald Trump’s version of ‘America First’ differ from the kind of localisation you have been proposing for some time? It was very noticeable that almost immediately after Trump was elected I was invited onto BBC Radio 4’s The World At One, to debate with right wing Tory Dominic Raab, who was waving his arms around and assuming that trade was a good thing. He didn’t really feel the need to have any arguments or evidence, and I was able to bring forward quite a lot of evidence around the destructive impacts of trade and particularly the fact that a very small echelon of society actually benefits from trade, the middle men and people who own factories, whereas a lot of people are actually losing quite a lot. There’s considerable research data from the UN’s trade body, UNCTAD, to demonstrate that. What’s interesting is that space has been opened up now to talk about whether trade is a good thing, and who benefits from trade, and who loses as a result of trade. What Trump is on to, and this was also a big part of the Brexit vote, was the fact that working class, particularly working class men, have actually lost out quite a lot as a result of globalisation. Because the deal has been “you can have a cheap t-shirt, and a cheap bit of electronic kit, and don’t worry about where it’s made, don’t think about the conditions in that factory, and don’t worry about the fact that you’ve now got a meaningless, routine, poorly paid job where you sit in front of computer (as we’re both doing now) and your identity will now come to you as a consumer, rather than as a producer”. And people have basically said “actually, I’m not happy with that”. Trump has made much of that politically, but it’s also opening up an opportunity for us to say, actually, we’re not happy with the off-shoring of jobs. We’re not happy with the loss of identity as a producer. And, perhaps particularly, we’re not happy with the fact that this type of globalisation has really empowered corporations, who are the people who mostly have power in the global economy, and mostly are benefiting from the system as it is now. How would you identify the key things that distinguish your approach and his approach? Whereas from my perspective, we would be focused on making sure that any system of economic organisation worked for the benefit of everybody across the globe. I said, in that interview in the World at One, that the principles of a Green approach to trade are global solidarity and environmental respect. You don’t want to have your lifestyle supported by people who have to work in very poor conditions somewhere else in the world, and very low wages. For example, wages in China are rising now but that just means the jobs are moving to Vietnam or Bangladesh or wherever. Each time it’s a race to the bottom and the wages are bad and the environmental conditions are bad, and that’s what we’re using to buy our lifestyle. That’s our critique. It’s not so much about, “This isn’t good for me here”, it’s about trying to keep that perspective of everybody across the planet, and making sure that everybody benefits from economic production and from trade. Of course the other side from a Green point of view is a deep concern for the environmental impacts of trade, which is obviously partly just the energy used in moving goods pointlessly across the world, but also it’s the fact that environmental standards vary very differently. Obviously in Europe we have the highest environmental standards in the world, and we think we should be exporting those high standards, rather than exporting the jobs to countries that have much lower standards. 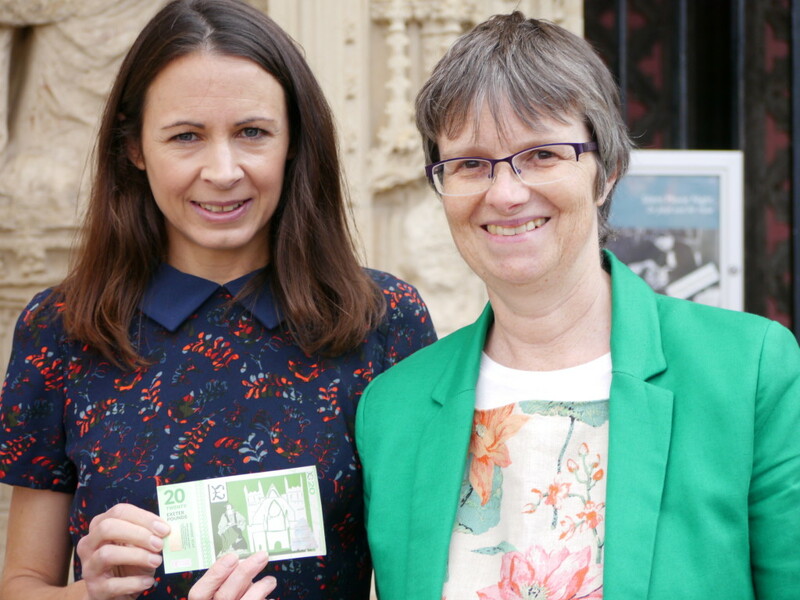 [Image below: Molly celebrating the Exeter Pound with Jo Pavey, who appears on the £20 note]. So in a world of ‘America First’ and Brexit, are there any opportunities do you think that emerge for community bottom up led initiatives like Transition that might not have been there before? Or doors open that might not have been there before? Absolutely. Because, to be quite frank, the main consequence of Brexit will be, as we’ve already seen, a fall in the value of the pound so the cost of imports is going to be much more expensive. There’s already an advantage for domestic producers which there wasn’t before. The first sector where this will show itself is in food production. In fact that’s also already the case. I was visiting businesses in Devon last week and they were explaining to me how they have now got a benefit for exporting, but also how imported food is much more expensive. That will really improve the business prospects of small producers, and it’s the sort of incentive for us to strengthen our local food supply chains I think. Last week I launched a couple of reports about how we’re going to support farmers after Brexit. One was written by Simon Fairlie and the other one was written by the Soil Association. They focused on high environmental quality farming and instead of giving cash payments to farmers depending on how much land they own, which means the richest people get the most money, which is obviously absurd, this is proposing we give money to people who set the highest environmental standards. Part of the impulse for that is the fact that Brexit is going to leave us more isolated and having difficulty importing and exporting because of the loss of agreed standards, but also really perhaps needing to rely more on our own production because it’s just becoming more expensive to import goods and particularly food. A few years ago you wrote a book called ‘The Bioregional Economy‘ which argued that the ideal was to devolve aspects of our economy back to the scale of bioregions. Firstly, do you think that post-Brexit that feels more possible or less possible? What I argued in that book is really about this principle of subsidiarity, which is a good European principle. A rather nasty dry sounding word, but a good European principle, about exercising power at the lowest appropriate level. I mean, it would be great if Europe had followed through on that, you know, because it would mean they wouldn’t be trying to force us to weigh our carrots out in kilos, which I still can’t do, and those sorts of issues they wouldn’t fret about. But on the other hand we would have global agreements on climate and we’d have European agreements on minimum environmental standards and you’d have a sort of hierarchy of rules and laws to protect people and the environment. I’m really suggesting that we need to think about subsidiarity more carefully because what Brexit has told us is that people are fed up with Europe involving itself in their everyday lives, and that’s just not necessary, but we haven’t followed through on that and tried to work out which level it’s appropriate to exercise various types of power. The bioregional approach is about saying actually an awful lot of stuff can be done at the bioregion. Health systems could be organised there, you could have particular cultures at the bioregion level. You would certainly look to the vast majority of your food and clothes and furniture and those types of products at the bioregional level. Nobody’s suggesting that you can’t have a pineapple or that every town has to manufacture its own computers. In order to work out where it makes sense to produce stuff, I then extended that principle of subsidiarity into the idea of trade subsidiarity, and the principle there was saying, you start at the local. You only go beyond the local if you actually can’t get hold of what you need within your bioregion. So if you wake up and you want a pineapple, you think, oh, you can’t grow pineapples in Gloucestershire (I love pineapples incidentally, and mangoes), then you think, “Well, should I be going to the supermarket and getting hold of a pineapple grown in Malaysia or Brazil, or should I be thinking actually there are 246 different kinds of apples in Gloucestershire, perhaps I could have an apple instead?” There’s an element of this which is genuinely about what you can produce, and then there’s an element of it that’s about rethinking how you decide what it is you need or want to consume. This was an argument I had with my daughter who was 14 when I started writing it, but she’s wised up a lot in the past 8 years, she agrees with me more now, but I was trying to argue that actually it reinforces your identity individually and as a community to buy local, to know all those apples that come from Gloucestershire. So instead of going off and saying “what fruit can I have today”, you’re choosing between these many apples that have very different flavours and you know, if you’re a meat eater you might actually know the difference between a Tamworth piece of bacon and a Gloucester Old Spot piece of bacon. You can know that. You can have tremendous variety and quality without having to shop in a global supermarket. The bioregional approach is about identity as much as it’s about reducing energy use. That kind of identity could help to solve the problems around Brexit, because it’s about saying actually consumption can tie you to local producers. It can tie you to local places in a way that might be substitutes for an identity you might have found through your work. [Editors note: just to state the blindingly obvious, our featuring Molly here does not represent an endorsement by Transition Network of the Green Party or its policies. Over the years we have interviewed people from most political parties on this website]. Excellent article and a good read. I agree with much that is written and applaud the intiatives that the Transition Network promotes. The importance of localised economies cannot be over-emphasised because it will not be long before the next global crisis arrives and this, I believe will, invoke a cataclysmic change in the way our centralised economies work. It is not possible to say when this will occur but given the current global events taking place in 2017 – it cannot be too far away, say a year or two at the most. So now is the time to get active and begin to set up sustainable, local economies ready for the massive changes coming to pass.